On the very day the normally staid Big Ten Conference went radical by announcing a newfangled two-division alignment to accommodate its new 12-school lineup, the league's most curmudgeonly coach, Penn State's Joe Paterno, broke a personal longstanding tradition. Paterno, who would rather alter the Nittany Lions' familiar conservative uniform scheme to include blue helmets and white shoes than start a true freshman at quarterback, did just that yesterday in naming Robert Bolden as the winner of the most drawn-out, confusing and perhaps temporary position competition since JoePa arrived on campus as a 23-year-old assistant coach in 1950. Bolden, a 6-3, 221-pounder who played last season at St. Mary's Prep in Orchard Lake, Mich., will take first snap in Saturday's season-opening game against Youngstown State in Beaver Stadium. The backups - for now - are 6-2, 225-pound sophomore Kevin Newsome and 6-1, 209-pound redshirt soph Matt McGloin. "Based on what we have seen to this point, Bolden has a slight edge right now, but we are confident all three quarterbacks are ready to go and hope to give them an opportunity to play until we settle on the one that gives us the best chance to win," Paterno said in a statement that suggested the selection is a definite maybe. Bolden, who replaces two-time All-Big Ten quarterback Daryll Clark, is 1A on the depth chart, with McGloin 1B and Newsome 1C. Bolden will be the first true freshman to open a season at quarterback since Wally Richardson played against Cincinnati in 1992. Gerry DiNardo, the former Vanderbilt, LSU and Indiana coach who is now an analyst for the Big Ten Network, attended a Penn State practice during preseason drills and came away convinced that Bolden deserved the opportunity to show what he could do in a starting role. "Bolden has separated himself physically from the other guys," he said. "To me, he throws the ball a lot better than his competition." Derek Moye, the redshirt junior wide receiver who led Penn State with 48 receptions in 2009, gave Bolden a qualified endorsement. "He has done a great job," Moye said yesterday. "He's mature, a lot more than a freshman. But I wouldn't say that I think he's better than anyone could have imagined. He came here with such high expectations." Mostly, those expectations came from Bolden himself. He didn't hesitate to sign with Penn State, even though he knew fellow blue-chipper Jones was also headed to State College. "I want to play as a freshman," Bolden said then. "I am going there to play. I don't want to redshirt, and I don't think I am going to." A 3-year starter at St. Mary's Prep, Bolden led his team to two appearances in the Division 3 state championship game in Detroit, where it lost both times to East Grand Rapids. As a senior for the run-first team, he was 65-for-142 passing for 872 yards and four touchdowns, and he ran 138 times for 537 more yards. "Robert is a very polished kid, very mature for his age," St. Mary's coach George Poirrot said last week. "More than that, he's a beautiful person. He leads by example. That's probably one thing they really like about him." 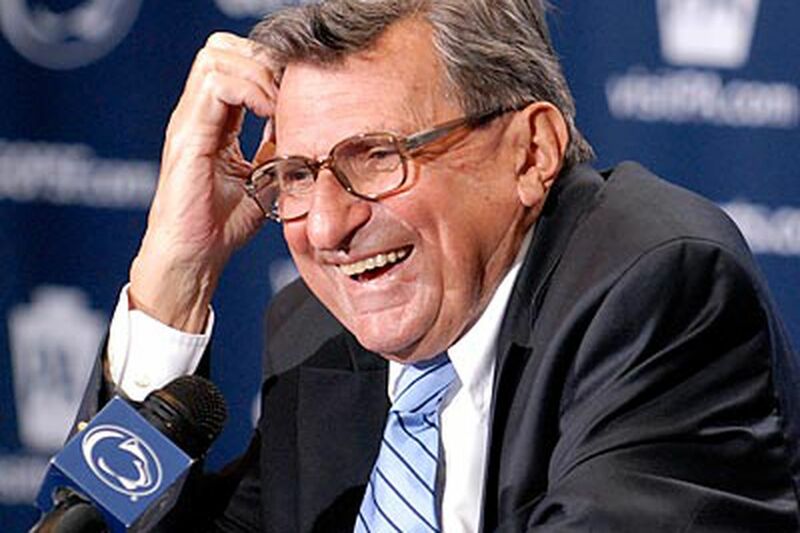 Paterno said all three quarterbacks likely could see action against Youngstown State in what figures to be nothing more than a glorified scrimmage. Although the Penguins won four Division I-AA national championships when Jim Tressel, now at Ohio State, was the coach, of late they've taken guarantee games for the money in exchange for bad beatings. They lost, 37-3, to Penn State in 2006, and have been outscored, 197-12, in going 0-5 against Football Bowl Subdivision teams over the past five seasons. The real test for Bolden comes on Sept. 11, when the Nits play at national champion Alabama, the consensus preseason pick to win it all again.